Dubai, United Arab Emirates- January 10, 2019: For the fifth year in a row, STEAM France and its French subsidiary S@TIS, with the support of Business France, will be exhibiting at the Arab Health show in Dubai, from January 28-31, 2019. 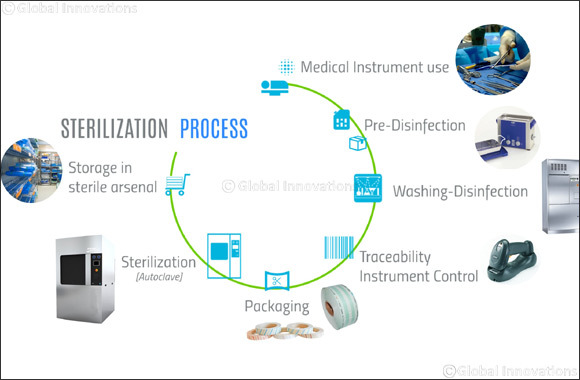 It will be presenting a software suite composed of multiple complementary modules, compliant with the requirements of international standards, and which enable, real-time and paper-free, monitoring of each stage of the sterilization process, from the operating room to the sterile arsenal. Intuitive and compatible with all types of equipment (washer-disinfector, autoclave, etc. ), whatever their brand or technology. S@TIS software suites for Medical Devices and Supervision System Traceability will facilitate managers’ efforts, thanks to an integrated statistical analysis tool, assessing the performance of devices daily and guaranteeing the security of the process – and thus of the patient. In fifteen years on the market, S@TIS has equipped nearly 250 sites in France. In the Middle East, it has been offering its Traceability software for two years, to make the link between the surgical instrument and the patient that much simpler. Its first client was Tawam Hospital in Abu Dhabi. Today, ADI - Abu Dhabi International Medical Services, the local partner of S@TIS is developing a solid commercial network for the future in the Gulf countries, drawing on its geographic presence, experience and skills. 2 tools to help monitor performance and treatment quality in CSSD - Central Sterile Services Department - environments. Soon, S@TIS hopes to win over multiple institutions in the Gulf and thus have further references to boast. Cycle monitoring and data logging for CSSD equipment Individual instrument tracking using data-matrix engraving to reorganize sets and instruments. Supervision process: independent measuring chain and automated validation of cycles. From January 28th to 31st 2019, S@TIS will be exhibiting in the France Pavillon, Arab Health - Za’abeel Hall 2 - stand B50 (STEAM France’ stand) at the Dubai International Exhibition and Convention Centre, Sheik Zayed Road Convention Gate, PO Box 9292, Dubai, UAE.